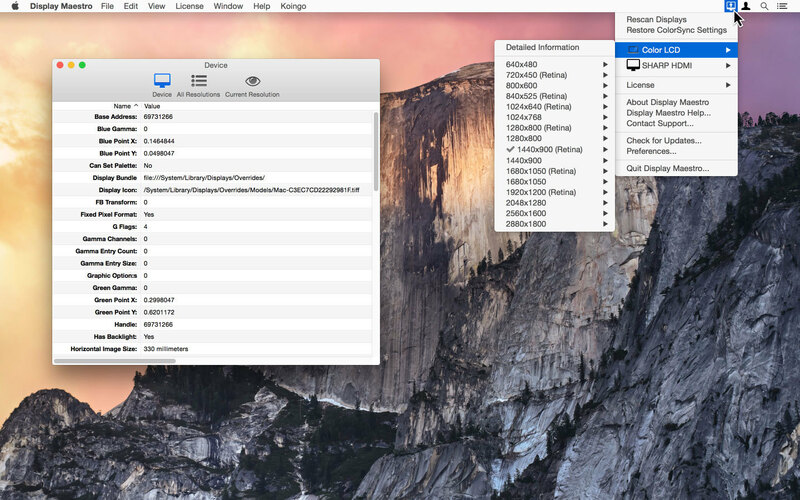 Display Maestro 2.0.2 – Optimize resolution and bit depth for attached displays. Display Maestro gives you full control over attached displays, allowing the usage of all available resolutions and bit depths. This is done by ignoring the operating system setting of hiding potentially unsafe resolutions. It is ideal for running legacy games which require 256-color mode and do not automatically switch the screen depth for you. Mac OS X 10.5 Leopard removed the ability to set 256 color mode manually using the built-in preferences pane, but the feature is now available here in Display Maestro! Display Maestro is a small application which can be configured to launch during login, and sits quietly in the menu bar. Upon exit, it will also automatically revert your display back to the resolution chosen before it was launched. Next story KeyCue 7.5 b1 – Displays all menu shortcut commands. Previous story Hypernap 1.3.2 – Quick and easy tool for testing web APIs. Name Mangler 3.3.1 – Easy-to-use batch file re-namer. Renamer 5.0.1 – Rename files in batches. Squash 1.02 – Easily compress and optimize images and photos.